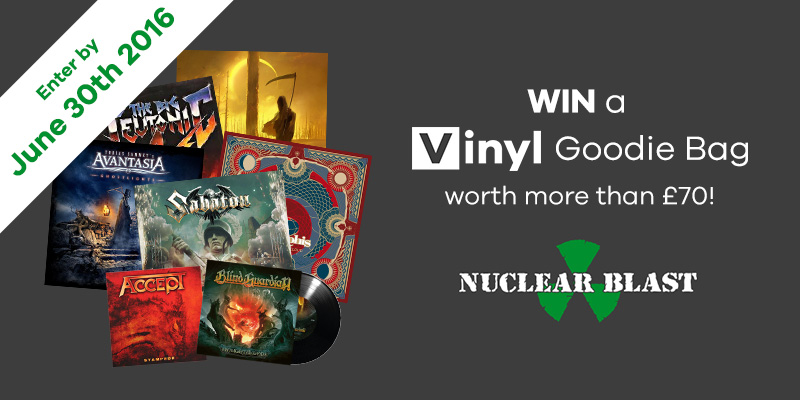 Win a Nuclear Blast Vinyl Goodie Bag Worth Over £70! We’ve teamed up with Nuclear Blast, one of metal’s best record labels, to give away an amazing goodie bag packed with vinyl worth over £70! With 7 awesome records, this prize is a must-have for any metal fan. Here’s what you’ll get in the goodie bag. The 9th studio album by the Finnish melodic death metal legends sees the band on top form, with catchy yet brutal riffs and some seriously impressive solos from guitar virtuoso Alexi Laiho. More melodic death metal goodness, this time from Finnish titans Amorphis. This is their 12th album but the band sounds just as good as they did on 1992’s The Karelian Isthmus. Blabbermouth described Under The Red Cloud as Amorphis ‘playing at a zenith of their talents’. Metal doesn’t get much more dramatic than Avantasia, the rock opera supergroup led by Edguy’s Tobias Sammet. Ghostlists concludes the tale started by previous album The Mystery of Time, in which scientist find a way to make everyone get along, only to face moral and ethical consequences. Being a rock opera, Ghostlists is big, brash and theatrical, with soaring vocals and epic riffs. Oh, and here’s a fun fact: opening track Mystery of a Blood Red Rose was written with Meat Loaf in mind as lead singer. It was later considered as Germany’s entry into Eurovision. German thrash legends Kreator, Sodom, Destruction and Tankard team up for another joint EP, covering heavy metal classics and proving why they’re every bit as awesome as the other big 4 of thrash. This thrilling 7” from German heavy metal pioneers Accept includes Stampede, the lead track from their awesome album Blind Rage, and a live version of Teutonic Terror. A must have for any Accept fan! Twilight of the Gods is power metal at its finest, which is no surprise as Blind Guardian are possibly the best power metal band around. This 7” also includes a live version of Time Stands Still (At The Iron Hill) recorded at Wacken Open Air. For your chance to win this amazing prize, click below! One lucky runner-up will also receive a goodie bag with t-shirts from Novelists, Devil You Know, Mahar, Blues Pills and Nuclear Blast, as well as a Nuclear Blast lanyard and rain poncho (perfect for festivals!). Win an ultra rare test pressing of Metronomy’s Summer 08 signed by Joe Mount! ← How many of these classic 70s albums have you listened to?